Dr. Brogan taught challenging and interactive political science courses at Albright College for 35 years. 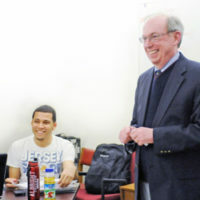 Professor Brogan’s goal as an educator was to prepare students for the realities of careers in politics, government, law, education and public service. To do this he encouraged all students to engage in the real world. As one of the most beloved professors on campus, when he retired in May 2013, many of his former students wanted to honor him in a way that was fitting for his passion and devotion to students. They chose a program that, to these alumni, captured the essence of how Professor Brogan advised his students: go out there in the real world through internships or volunteerism. That was the beginning of The Brogan Scholars Endowed Internship Fund. A stipend from the revenue generated by the Brogan Scholars Endowed Internship Fund will be awarded to exceptional students each year to complete an unpaid policy or government related internship (including in the judiciary) in Washington, DC, or a suitable agency/community organization in another location. These are for-credit internships and can take place in any semester. There are no restrictions concerning the major of any student applying for this stipend. Applications for the award are due in late fall for an internship taking place in the summer or the next academic year. An applicant must supply basic student information, major, a short essay no longer than 500 words describing interest in the program and specifying the field in which he or she would like to intern, and a description of how this opportunity would enhance his or her studies. Each student must also submit an unofficial transcript and a letter of recommendation from a faculty member by December 1 to the person designated on the application website. Recipients will be chosen by a selection committee after the application and interview process is completed. The amount of the award will be determined by the currently spendable funds from the endowment, ranging from $1,500 to $4,000. Click here for the application. Links to local, regional, state, and national internships can be found on the following pages. In addition to these opportunities, students can choose to intern on Capitol Hill through a program affiliated with McAllister & Quinn LLC. Representatives from McAllister & Quinn will work with the selected student to identify internships that match the student’s career goals. Please be aware of the opportunity to learn more about the connections that McAllister and Quinn have in the Washington, DC area. This is a rare opportunity to secure an experience “on the hill” that other college students do not have. If you are unable to attend the meeting, contact the ELCDC for information. The lists below are suggestions for you to locate other opportunities that may match your interests and career goals. If, when you click on the name and it goes directly to the organization’s home page, find the careers page or the internship page for the specific information.